Loving God: Are you a Spiritual Adulterer? Today I was looking and searching for a topic to write about and I came across something that struck me or more like convicted me. I narrowed my choice to two topics. During this mental “tug-o-war” God directed me to Hosea. I will say that I didn’t want to read it because I was so hyped up on “exploring purpose” and picking out “what not to do when given divine instructions” that I almost missed one of the best lessons God had to teach me . This means they did everything for their other gods to please them but when it came to the Lord He became an afterthought . They put all they had into these “sideline affairs” with these other gods and they received nothing in return. Although there were limited results, they continued to pursue those things that did nothing to help them. The line that says “But me she forgot” made me realize that I was/am Israel and I felt ashamed. At that moment, I realized how God feels when we as his people put things in front of Him. I imagine how he feels when we in our present day build things up in our lives to be small gods. How do you know they are small gods? My way of knowing they are small gods is by reviewing my priorities. What things am I willing to do to get the things I want? How much of my schedule am I willing to rearrange to be with someone? How far am I willing to go to impress someone? The time that I spend pursuing happiness is the time that I could spend with my God. The guilt did not stop there because in the next verse , it begins to tell of how the Lord was going to restore Israel in the future. What, is He serious! After all of the things that Israel has done! Yep He says “Therefore I am going to allure her; I will lead her into the wilderness and speak tenderly to her. 15 There I will give her back her vineyards and will make the Valley of Achor a door of hope.” Even in discipline God is telling of how He will win Israel’s heart. When I finished reading all I could hear is when will you love God like these things that you want. There is nothing wrong with praying for things but gosh when will we pray “Lord I want to get to know you. I want to love you like I first loved you. I want to love you so much that the things that I prayed for are the extra perks and not the main reason for me talking to you” . We want things so much that we forget the source and that we have a relationship with Him that tops all relationships and things. My sacred time with my Lord should not be just about the things that I think I need or want . My first priority should be to my Lord and Savior. I have been overlooking my Lord as my first, my last, my everything. Now what will you do??????????? I knew He would come through! I knew it! 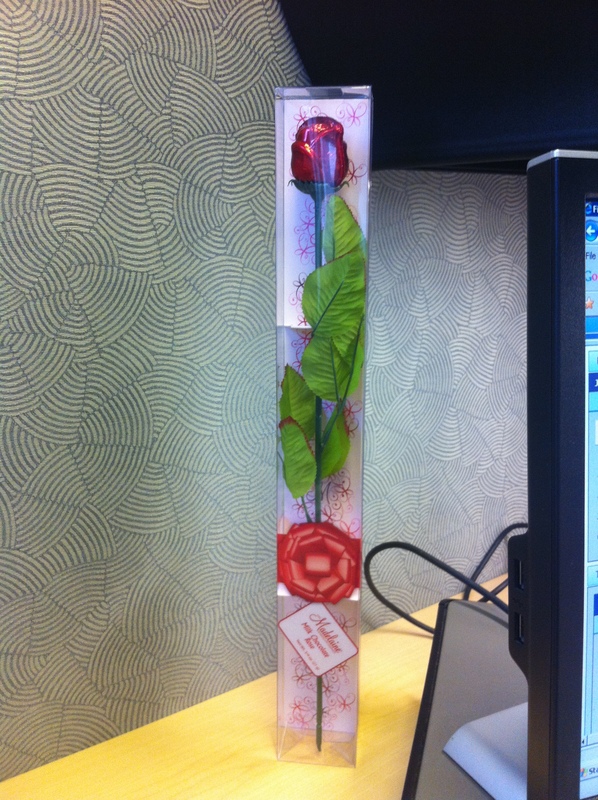 Jesus gave me a chocolate rose for Valentine’s Day! Ha I believe and He did it . You see some weeks ago I knew this day would come so I said I am going to ask Jesus if He would He be my Valentine. He said Yes (John 3:16) ,of course, and I was happy with that. But in the back of my mind I was like “Lord I know you said yes but can you give me something so I know you heard my prayer ” . It did not have to be big and flamboyant as flowers or a jewlery. I just wanted something to say “I heard your prayer” . So as the days went on I kind of got this feeling that He was going to give me something . And what do you know! I got a chocolate rose from my Secret Pal at church! Awesome, right? Ha just awesome! Well ,I tell you this to remind you that God hears all of our prayers, even the small ones. And if He would fulfill a small prayer as small as a chocolate rose then you have to know without a doubt that He loves you more than you can ever know . He is the greatest love story that will ever be told. So if for this Valentine’s day you are alone , single , just broke up with your honey bunny , don’t worry you still have a great Valentine in Jesus. Besides , He loved you first and more than any other person ever will .